A great deal has been written about Sidney N Castle in our eBook and the information therein regarding his life and times will be of interest to our readers. As is known Sidney and family lived in Kingston upon Thames for many years at his house known as Woodbines. It had a frontage on the River Thames. Unfortunately the house no longer exists. Sidney played a prominent role in Kingston life and in recognition of his achievements a street there has been called after him. 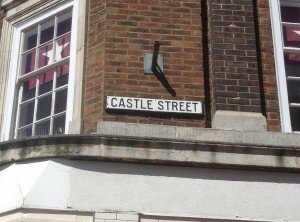 We found this street on a recent visit to Kingston and we were able to corroborate that it was indeed named in his memory – see photograph above.